The 387-000 0.7X Wide Angle Adapter has been design specifically for use with the Fujinon TF4XA-1 4mm 3CCD HD lens. The 387-000 converts the 4 mm prime lens to a 2.8 mm focal length while maintaining the high definition 200 cycle performance of the prime. 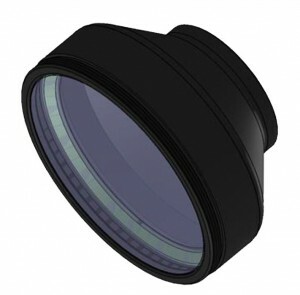 The 387-000 Wide Angle Adapter will increase the Horizontal FOV from 71° to a minimum of 95°. The MTF curve below shows the performance of the Wide Angle Adapter. 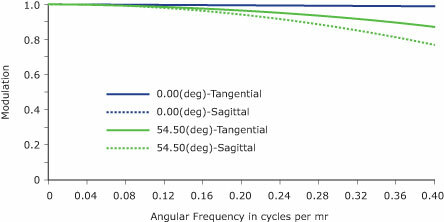 Please note that when measuring the performance of an adapter that works with a prime lens the MTF is measured as Angular Frequency in cycles per milliradian. In this instance 0.40 mr is equal to 100 cycles. Dimensions of the 387-000 are 60.5 mm diameter and 34 mm long. The adapter mounts on to the TF4XA-1 via the 30.5 mm external thread on the front of the prime. The 387-000 Adapter has an M60 x 0.5 thread on the front to facilitate the mounting of filters.